WAXIE Shield offer a variety of disposable gloves designed for most applications from medical to food service, janitorial cleaning and more. 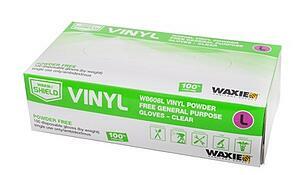 Whether you require Latex, Nitrile, Vinyl or Synthetic Vinyl we have the glove best suited for you. Choose from powder-free or powdered, and exam grade or lower cost general purpose grade gloves, available in the following sizes Small, Medium, Large and Extra-Large. Latex Gloves are natural material, made out of rubber. 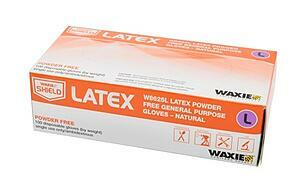 Latex is a popular choice of protective glove for medical or industrial use. The primary reason people would choose an alternative to latex is because many people suffer from latex allergies. When allergy is not a concern, latex does have a slight advantage with comfort and dexterity over nitrile gloves. Nitrile Gloves are made out of a synthetic rubber, and are an ideal alternative when latex allergies are of concern. 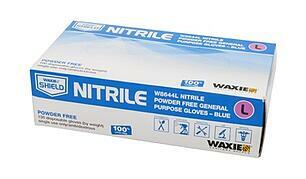 Nitrile gloves are the superior glove when it comes to puncture resistance. 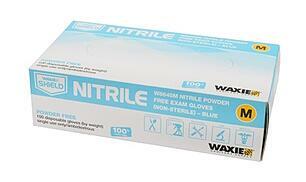 Nitrile gloves have a high level of sensitivity and mold to your hand for a great fit. Synthetic Vinyl gloves offer a glove with similar characteristics to a latex glove but is entirely latex free. Made of high quality stretch PVC polymer resin the Synthetic Stretch Vinyl Gloves offer a better flexible material than vinyl gloves which reduces hand fatigue during extended wear. The soft and solid fit of the gloves provides strength and durability that greatly reduces the chances of tearing. 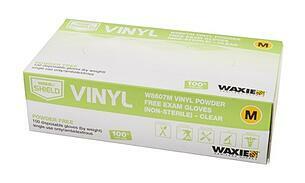 Ideal for hands that are sensitive to latex or donning powder. Powdered gloves are made with USP absorbable dusting powder and are FDA accepted. The powder is composed of food grade cornstarch. It allows the glove to be easily taken on or off. Keeps gloves from sticking together but can leave residue on hands. Powdered gloves can increase the risk of allergic reaction as they absorb protein from the glove which can be left in skin pores or become airborne when removed and then inhaled. Powder-Free – Non-powdered gloves are usually treated with chlorine wash and/or polymer coating processes. The latex protein content is substantially removed from the glove when these processes are used to remove powder. Eases on/off of glove. Both chlorinated and polymer coating treatments for powder-free gloves are effective at creating a glove that dons and doffs easily. Done correctly, both processes yield gloves that exceed FDA and ASTM standards for hand protection. Exam Grade versus General Purpose Gloves AQL stands for Acceptable Quality Level. This is a quality specification that manufacturers, as well as the Food and Drug Administration (FDA) use to specify the pinhole rate in medical examination gloves. FDA standards specify an AQL of between 1.5% and 2.5% for the medical examination gloves. This means that the defect level from a large number of gloves will not exceed 2.5%. Exam Grade Gloves are different from general purpose gloves in that they must meet a series of FDA regulations in order to be marketed as exam grade gloves and are accepted for use by doctors, dentists, labs or any other application requiring a specific barrier to blood or infectious agents. Exam gloves are regulated by stringent FDA requirements requiring specific production and quality control standards. General Purpose Gloves are for use in food service, industrial or any other application that does not require a specific barrier to blood or infectious agents. This is the most common glove found in the marketplace and popular uses include food service, packaging, automotive, painting and health & beauty. What differentiates the gloves is a higher AQL for the Exam grade gloves than the general purpose gloves. How to choose proper chemical resistant gloves Identify the chemical you are working with. 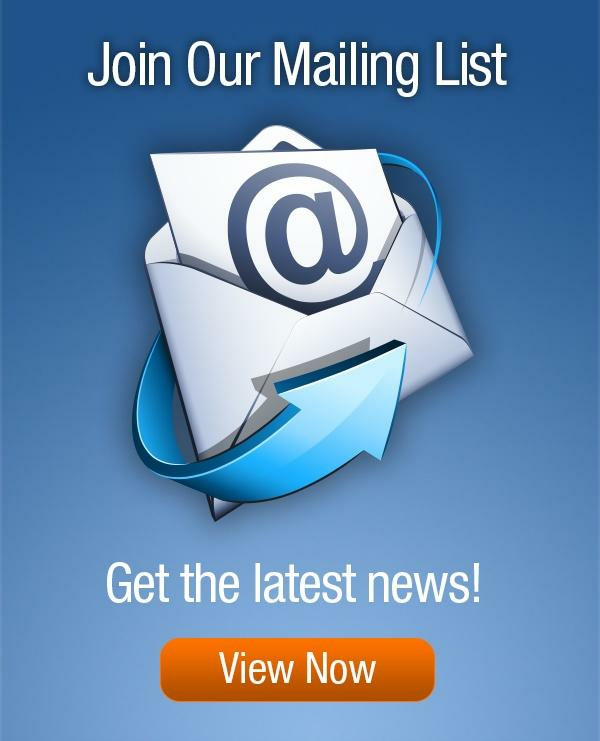 Request more information from a WAXIE Consultant!